MVD Entertainment Group is proud to announce MVD Rewind Collection #3 BLACK EAGLE in a two- disc Blu-ray/DVD Special Edition combo pack coming February 27th, 2018. Synopsis: : After an F-11 gets shot down over the Mediterranean Sea, The U.S. government cannot afford to lose the top-secret laser tracking device that was on board. But unfortunately, the KGB team lead by the infamous Andrei (Jean-Claude Van Damme, The Expendables 2, Universal Soldier) are beating the CIA in the race to find it. The CIA has no choice but to call in their best man, master martial-artist Ken Tani (Sho Kosugi, Ninja Assassin, Revenge of the Ninja), code name... BLACK EAGLE. In response, the KGB resorts to an all-out war, with powerful Andrei matching Ken blow for blow. From legendary action director Eric Karson (The Octagon), Black Eagle also stars Doran Clark (The Warriors), Bruce French (Jurassic Park III) and William Bassett (House of 1000 Corpses). - Sho Kosugi: Martial Arts Legend (HD, 21:26) (featuring new interviews with Sho Kosugi and Shane Kosugi and more) MVD Rewind EXCLUSIVE! 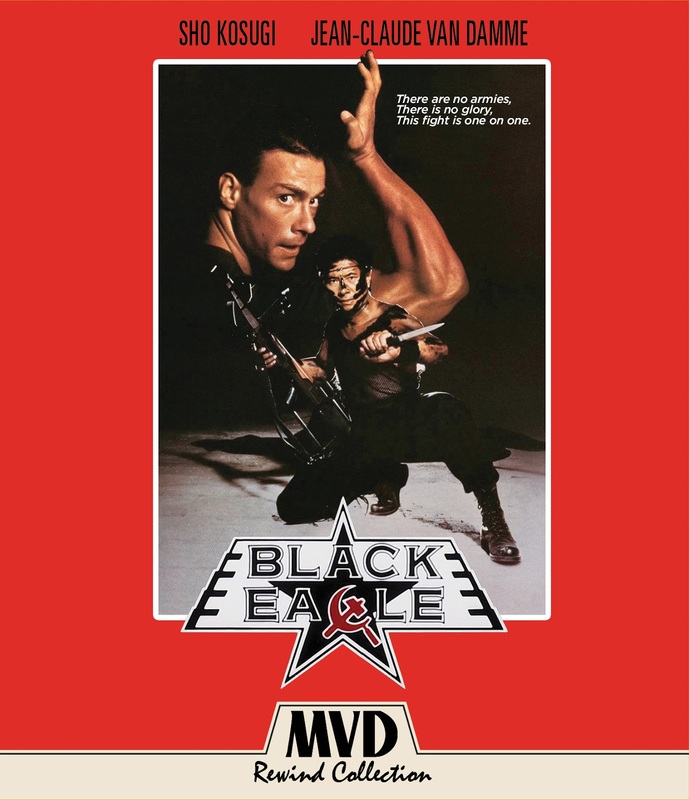 - The Making of BLACK EAGLE (HD, 35:50)(featuring new interviews with Director / Producer Eric Karson, Screenwriter Michael Gonzalez and stars Sho Kosugi, Doran Clark, Shane Kosugi and Dorota Puzio) MVD Rewind EXCLUSIVE! -mTales of Jean-Claude Van Damme (HD, 19:20) (Brand new interviews with cast and crew tell stories about working with the legendary action star) MVD Rewind EXCLUSIVE! - The Script and the Screenwriters (HD, 27:14) (featuring Michael Gonzales, Eric Karson and more) MVD Rewind EXCLUSIVE!